Ruby on Rails (RoR) refers to an open source framework used in web development which has revolutionized the manner web applications are created and developed. This framework offers web developers with all the components and tools that they need to develop more powerful and useful applications in a more intuitive development setting. If you are an existing web developer, then you have to look for ways to learn Ruby on Rails as this is effective in making the whole web development process more efficient and less cumbersome. The framework was actually developed by David Heinemeier Hansson in the year 2003 and since then, it has never failed to satisfy the needs of various IT professionals especially those who are responsible in developing web applications. Using Ruby on Rails allows you to enjoy a lot of benefits. One of these is that it works in completing the process of building web applications fast. It also works with less code while also giving its users an easier time maintaining its good condition. You will also enjoy the simplicity of its framework. All its functions are directly built into its framework and this is a major help in fully eliminating the need for configuration files that are somewhat clunky. All that you have to do is to notify RoR about the specific location of your database. Another advantage of RoR is that this is proven to be more powerful, concise, readable and elegant. It also supports the development of fully functioning and scalable websites that you can easily maintain without spending a fortune. If you are curious about how Ruby on Rails works and you want to learn everything about it, then the Ruby on Rails certification program from Brainmeasures is the most recommended online certification course for you. The Ruby on Rails course from Brainmeasures is a huge help for you especially if you want to obtain a clearer background about the RoR framework including the many features that are installed in it. With the highly comprehensive Ruby on Rails training that you can get from the program, you will be able to understand all the concepts, tools and strategies associated to using the framework and the many useful features that are installed in it. To complete this certification course and finally get your RoR certificate, you need to take and pass the online Ruby on Rails exam developed by the RoR professionals and experts in Brainmeasures. 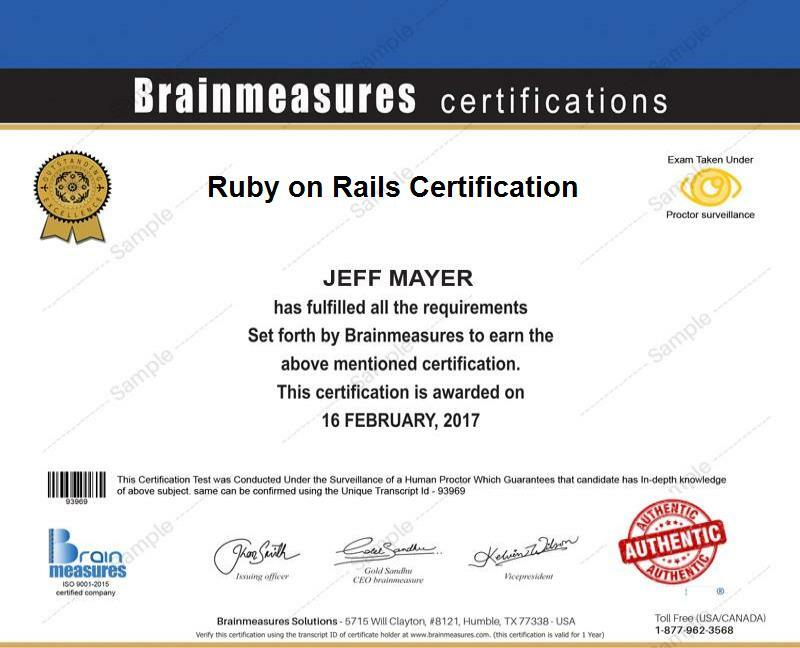 The Ruby on Rails certification program offered by Brainmeasures is open for anyone who wishes to understand RoR, its uses and its many features. It is suitable for new and experienced programmers who wish to get to a fundamental knowledge about Ruby on Rails developments, understand object-oriented concepts in programming including methods, loops, classes and conditionals, become more comfortable when using the RoR framework in programming and create an app using Rails or make improvements on existing ones. Being a Ruby on Rails certification holder is a huge help in your attempt to receive a more reasonable pay. If you decide to get engineering positions after earning your Ruby on Rails certification, then you can expect this career to offer you a stable pay of around $74,000 to $105,000 annually. If you work as a Ruby on Rails developer or programmer, then your earnings will grow from $86,000 to $114,000 per year exclusive of bonuses and any other monetary benefits provided by your employer.